Commendable, old chap, no ? I tried to find some additional information on Greening the FCO on their website, but couldn't . The FCO produces an Annual Report, and though it does mention the importance of Britain developing a low-carbon economy, the closest it comes to CSR is the Comprehensive Spending Review, which i think is FCO-speak for budget. What does all this have to do with CSR reporting ? This. Two Annual Environmental Reports published by the British Embassy in Sofia, Bulgaria, the later of which you can download here. As far as i can tell, this is the only British Embassy post which publishes this type of report. I couldnt find any other Embassy of any country that produces a CSR or an Environmental report. Big big round of applause for this initiative to the Brits in Sofia. It's a nice report, 16 pages, covering everything from the Embassy 7-member Green Team, the modern glass Embassy building with heated sub-floors, the Embassy Environmental Policy and external Environmental Audit, Key Performance Indicators and targets, including medium term up to 2012, Carbon Footprint, and an Environmental Pledge by all the Embassy members. A short report, but a significant one which demonstrates a strong commitment. Though I would hope to see them expand the scope a little to include social impacts in future. Embassies can be very influential in addressing social and human rights issues, as well as, via the Trade sections, help encourage awareness for responsible business practices. UK Companies are in leadership positions on this, and foreign Embassies could do much to help leverage this abroad. I hope that more Embassies will take the lead from the Sofia Brits. This is largely uncharted territory for this type of organization, so more pioneers will be welcome. Does size really matter ? Should small Companies report ? Do you agree with the statement that "CR reporting is for companies with large footprints" ? Does the size of the Company, and its footprint dictate whether a Company should be transparent and accountable to its stakeholders? Is it true that "that large companies have many more resources than small firms" and therefore, large Companies can afford to report and small Companies cannot ? Should a small Company content itself with "more written policies and statements about our impacts"? The quotes (in red) above are from Toby Webb, the founder and manager of Ethical Corporation. (The questions are mine!) I have met Toby briefly a couple of times, when I have attended Ethical Corp's conferences, which are very good. I regularly follow his blog Reflections on Ethical Business which I genuinely find to be one of the best blogs around on CSR, full of sharp insight and commentary. Recently Toby posted "Twelve reasons why I won't read your corporate responsibility report", and my response, which was basically that the twelve reasons Toby mentions for not reading CSR reports, are precisely the reasons he should read reports (call me argumentative if you like, but check it out), led to a ping-pong of why reporting is for all organizations, irrespective of size (me) versus why a small business doesnt need, or have the resources, to report (Toby). This prompted me to bring the ping-pong on to my territory, a blog about reporting, for all organizations (ALL organizations) and elaborate on why I believe this to be so. What is reporting ? It's a process by which a business, after reasonable dialogue with stakeholders, considers the most material issues for them, the stakeholders, and for its business sustainability, and is transparent about how it performs on matters of stakeholder interest. Reporting is part of the loop of dialogue - we listen, we act, we respond, we listen again. The report is the periodical output of this cyclical process. The process itself builds relationships, trust, management discipline, identifies risk and oportunity, contributes to positive reputation and enhances investor interest, to name but a few benefits. The resources required to produce a report are do not need to be overwhelming - more often than not, the design, printing and dispatch of reports can cost more than the investment in wirting them, or the consultant fee. Most of these cost elements can be avoided by a producing a PDF download or an online report, with modest graphics. The content is what counts. In a small business, personnel resources may be more limited, but the issues are far less complex than in a big global business, and require less personnel. So i think this we-ain't-got-the-resources line is a cop-out for not applying rigorous thinking to sustainability, or accepting accountability. Oh, and let's face it, no-one reads reports, anyway, right ? In Spain, 822 SME's now produce CSR reports. Why ? It enables them "to increase their competitiveness in a setting where transparency and distinguishing features play an important role. ...... the preparation of the reports initiates the enterprise in the main aspects of CSR while encouraging it to develop its skills of self-diagnosis." This is reported on the Instituto de Crédito Oficial website, an organziation which assists SMEs to report. The Global Reporting Initiative website has a section dedicated to support for SME's , and lists a whole string of SME's who report. In an interview with Scott McAusland on the GRI website, he says that SME's " account for about 90% of businesses worldwide and 50 - 60% of employment." Often SME's are part of MNE (multinational enterprise) supply chains, and therefore may have a need to demonstrate ethical, accountable and transparent behaviour in order to stay competitive. CorporateRegister.com's 2010 CR Reporting Awards has a special category for SME's , as in previous years. You can find many SME reports in the CorporateRegister.com database. The European Commission produced an excellent guide for SME's for communicating CSR. Whilst the focus of this guide is communications, of which reporting is only one element, it lists many compelling reasons for SME's to communicate abobut their CSR activities, with a CSR report included in the different channels reletvant to different stakeholder groups. In a post back in July 2009, called You don't have to be BIG to do CSR, I gave an example of an SME from Moldova who reported many positive impacts which almost certainly no-one would ever know about had they not reported themselves. Local competitiveness and reputation are just as crucial here as for bigger businesses. Many of the reporting SME's confirm that both the process and the report deliver significant benefits as mentioned above. It is important to note that the process cannot succeed without the product of that process - the report itself - a periodical health-check of strategy and metrics, and renewed commitment. A report is the most appropriate vehicle for this - as part of a total csr and communications strategy. I dont see this as a privilege reserved for only the big blockbuster corps. What might a Company like Ethical Corporation have to gain by a reporting process and publication of a report? Stakeholder engagement and materiality analysis could throw up new insights about ways to serve stakeholders and do more, better, business. At worst, it will provide an external reality check of how the Company is percieved by those who can influence its sucess. An environmental risk and impact assessment, followed by an Environmental Policy and Action Plan could deliver several benefits - cost savings through improved internal environmental practices, travel habits, printing and sustainability in events management. A statement of mission, values and perhaps even a Code of Ethics could serve to align employees and all contributing writers to the Company's "what we stand for" and support the building of alignment, trust and reputation. Marketing practices for example are an important element of this too. A review of Human Resources practices - even with a small team - could assist the business in improving employee engagement and beoming more attractive to potential employees. A review of how the Company contributes to the public good through its business activities, and involves its employees in community activities or supporting social causes could contribute to positive reputation, improved egagement and skill development. And more than anything else, scoping of Ethical Corporation's indirect influence on its many readers and conference attendees could provide the business with a platform to measure and increase its influence and potential readership. Through a "Green Conference Facilities", for example, the Company could provide attendees with an opportunity to make their own contribution to environmental sustainability. And finally, the compiling of all of this into a periodical, coherent report would provide a basis to maintain this cycle of planning and improvement, track performance and maintain a leading edge. Would this sell more mags or bring more people to summits ? Maybe not in the short term. But we all know that sustainability is a long haul and not a quick-buck thing. And it really doesn't matter how many people the Company employs or how many $ it earns. It's all about impacts. As Dolly Parton said, as far as i recall, "If you think you are too small to influence, you have never been in bed with a mosquito". Note that i haven't even touched on the sense of duty we might assume of a Company whose core business is communicating about business ethics and "encouraging debate on responsible business" . The GRI produces a report, BSR produces a report, The Guardian produces a report. Enough said. I don't hope to convince Toby or Ethical Corporation, and i understand that every business must choose its own ways of doing things. My comments could apply to any small business, not just Ethical Corp. I just felt the need to share my perspective in good spirit on something i have, as you may have noticed, strong views about. And by way of disclosure, I am a CSR report-writing consultant so i am not totally objective. Thanks to Toby for allowing this debate on his blog - I expect i am getting on his nerves a bit. Oops! Next time i see him at a conference I will buy him a Chunky Monkey! The Human Resources function is a critical partner in the development of a responsible and accountable corporate culture. Corporate Responsibility is often referred to as improving impacts on stakeholders. Nothing new here. Employees are stakeholders. Nothing new here either. The better you treat, or impact on, your employees, the better the business will perform. Numerous statistics and surveys prove this correlation. The engagement of every employee in the business is really the only way to ensure flawless corporate responsibility. I am reading Adam Werbach's book at the moment, Strategies for Sustainability, and quite by chance, or not, he makes the same point - more eloquently than I do, I must admit. However, it's nice to be in such illustrious Company. Adam says: ... "to execute a strategy for sustainability, you must engage individuals personally" (page 132). Ultimately, corporate reponsibility is not just about treating employees well, or investing in their development, or providing a ramp if they are in a wheelchair. It's not only about how satisfied they are on the job. Corporate responsibility is transforming every employee into an ambassador of the corporate responsibility message of the business. Ensuring that they understand, are involved, are inspired and know where they can play a role. This means moving from impacts ON employees to impacts OF employes. Each employee in the business interacts with any number of stakeholders every day, maybe thousands of daily connections. This potential, to turn every single stakeholder interaction into one which moves the CSR agenda forward, is more powerful than almost any other single business activity. CSR reporting is often seen as something which primarily benefits employees. Through the report, they get a comprehensive view of the way their Company interprets and progresses sustainability themes. Often, the CSR report contains news and information which had not cascaded through to them via regular internal communication channels. In some cases, Corporate Reponsibility reports even state the names of individuals in the Company who are responsible for progressing different action items - an example of this is Vancouver City Savings Union (Vancity) (page 35). But when I recently tried to ascertain how many Companies actually track how many employees read all or part of their reports, I couldnt get an answer. I found one example of something coming close to this on the Adidas website where readers of their online report are asked to own up and identify themselves. The results are displayed in a neat graph. 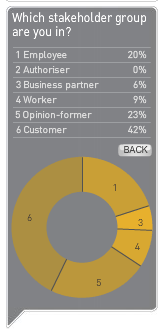 We dont know how many people took this survey, and I am not quite sure what the difference is between an employee and a worker, but this is a great way to see what kind of people are taking interest in the report. And a very brave move on the part of Adidas to have an open survey such as this on their reporting site . In a recent dialogue with Symantec, i understood they progress many activities in the framework of internal communications to ensure employees are aware and engaged. But, bottom line is, overall, we DON'T KNOW if employees take any sort of interest in one of the most important documents the Company publishes to stakeholders, and if they are capable of being the ambassadors for that document, and the Company. Who is repsonsible for this ? After the CEO, it has to be the HR Function. The HR function must ensure proceses are developed within the busnesss to raise employee awareness of key strategies and processes, especially those which are in the public domain. Why doesnt HR do this ? Because, I submit, most HR Managers just don't see how they link to Sustainability strategy, beyond matters relating to ethics and values, and sometimes, community volunteering (because no-one else does it). Most HR Managers really don't see the relevance of ensuring high quality communications and dialogue about sustainability programs. When was the last time you had a progressive conversation with an HR Manager about sustainability in the supply chain and the HR role which supports that ? How do HR Managers recruit people into sustainability jobs ? In what ways does HR adopt sustainable practices as a function ? Most HR Managers cannot tell you. The HR function has still not grasped the principles of a stakeholder society and stakeholder-driven business. 80% and 70% respectively say this involvements relates to ethics and community involvement, with zero being involved in supply chain practices and external stakeholder engagement. and one HR Manager, in responding to the question "What does the concept of Corporate Social Responsibility mean to you ?" wrote : "Sustainability" . Well, at least that's something. I promise to update you all with the results. Thank you ! Embed. Once more. Interweave CSR into the fabric of your business. This is my fifth and final post on this subject, (for now!) inspired by Ethical Corporation's 2009 research report called How to Embed Corporate Responsibility across different parts of your Company.We already covered how people do it (embedding CSR in Human Resources ), how buyers buy it (Procurement function ), how accountants count it (Finance function ) and how truckers truck it (Operations and Logistics Function). Now, we examine how they all talk it. Embedding CSR in corporate communications - internal, external, marcom and reporting. With case studies and insights from the Man Group (don't worry girls, this isn't a gender thing, the Man group was founded by James Man over 225 years ago. Not his fault if he had a gender-biased name), Hewlett Packard, Novo Nordisk, BT, Vodafone, Starbucks, Pepsico and reference to research findings from McKinsey, embeddng communications covers reporting (ahaaaaaaaaaaa, my favourite subject. See ? I saved the best for the last) and how to make reporting effective, marketing to consumers using CR messages, and communicating with your colleagues internally. One of the things I liked in the research paper was a quotation from the Global Triple Bottom Line Management at Novo Nordisk who said that the report is a key method for "keeping the Company accountable for performance". This is often underestimated as a prime use for CSR reports. The more internal and external stakeholders that know about corporate goals and objectives, the more pressure there is on the individuals in the business to deliver. Another interviewee goes even further and says that reporting should drive behaviour change. In my experience, this does happen. Another thing about CSR communications is that the core message should be spead by every employee in the Company, in a way that is relevant to her or him, and her or his role in the business, and in her or his own words. I will illustrate this with an example from one of my clients in the local market. Communications and dialogue has long been at the heart of the comme il faut fashion house in Israel. 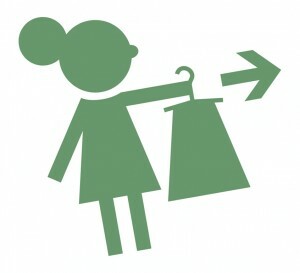 Every bi-annual fashion collection is supported by a social campaign which involves employees and customers in dialogue. Last season's campaign, a bold move, was centered around customers bringing to the Company an unwanted bra, in return for which they received a discount on new purchases, whilst the Company donated cash to support healthcare for women trapped in prostitution. You can imagine that the subject of prostitution is not one which is easily introduced into the world of fashion, beauty, positive body image etc, and it was not without a certain trepidation that this company for women, known to be outspoken in promoting women's rights, decided to stand up publicly for women who have been abused by society. Before this campaign launched, many internal dialogues were held with employees of the fashion house, both to help them understand the plight of women trapped in prostitution and protitution survivors, who still need much support, and also to build their skills in engaging customers on this subject. I facilitated many of these conversations and was fascinated by the range of insights this brought out. Subsequently, during the campaign, each of the several thousand customers who donated a bra engaged in a conversation about prostitution and also benefited from new insights. The current campaign for the Winter 2010 collection is themed Re-fashion, and looks at what endears us to certain items of clothing year after year, and how we can re-fashion and re-fresh them so that they can serve us even longer, inspired by the principles of environmentally preferable "slow-fashion" . Customers bring in an item of clothing, which the comme il faut designers examine in order to understand why that particular garment is so special that it stands the test of time. The customer gains a discount on new purchases and the opportunity to win a $5,000 new wardrobe. And women trapped in prostitution get a new garment as a gift from comme il faut for every old one that is brought in. This has doubled the conversation effect. Not only is the social content still present, but now the Company can engage customers in conversation about their most intimate reasons for wearing the same pair of trousers, or the same blouse or skirt, year after year, and use the customer experience in the new garment design process. Why is all this important ? Because these campaigns embrace the principles of corporate social responsibility in processes based on communications. They require every employee in the business to understand and engage with the campaign and what the Company is trying to communicate. It makes them think about their own role in supporting the campaign and furthering the commercial and social objectives. And it help them understand the way others think and use this in making business decisions. And this, in my view, is what embedding CSR is all about. By the way, you can read comme il faut's CSR report (I led the writing of this report) here. Paper conservation at Heinz - or not? "Reflecting our commitment to environmental responsibility, Heinz has conserved paper and the energy used to produce it by publishing our 2009 Corporate Responsibility Report exclusively online. This online report provides more in-depth information than previous reports about our corporate social responsibility activities and includes multimedia elements. In addition, we are offering a customizable PDF so readers of this report may print out any sections they wish." What is it about CSR reports that they are held up as the sole example of a Company saving the planet by not printing it? What about Annual Reports? Heinz makes it really really easy for anyone, not just investors, to order a printed copy of an Annual Report . There is nothing in the rest of their CSR report about conserving paper. Reduced printing in everyday operations? Percentage of recycled paper consumption ? On-line billing? Zilch. The only example we have of Heinz's commitment to conserving paper is this one single example of a sustainability report. There are many good reasons to produce on-line reports, beyond the conservation of paper. And Heinz reports many good examples of environmental positives including reducing packaging initiatives and more. But if the CSR non-printed report is the only paper-conservation exercise that is highlighted by a Company, I begin to wonder how balanced their reporting is. Most people will understand quite easily that environmental opportunities are abundant in the Manufacturing and Logistics functions. With examples from Boots, Hewlett Packard, Novo Nordisk and Vodafone, the report cites examples of innovative solutions in different aspects of the supply chain which offer benefits for customers and the business, and which have been developed using insights and suggestions of those involved on the ground. Opportunities such as haulage partnerships with non-competitive companies to optimize truck payloads, recycling and re-use rather than disposal of products, real-time energy monitoring are some of the solutions highlighted. The key common demoninator of the development of these solutions is : dialogue. Creating a culture where employees of the business, suppliers and customers can contribute to developing triple bottom line solutions is core. Developing new ways of doing things, and maintaining a constructive dialogue with suppliers, customers and employees does not happen automatically. A company looking for CSR opportunities in the manufacturing and logistics functions needs to define its objectives and create awareness for the concepts of social and environmentally preferred ways of manufacturing or trucking. This means creating communications processes for all these stakeholders, so that CSR is part of their mindset when they are reviewing operational activities. "Greening employees" for example, reflects the process of educating, informing, involving and inspiring employees regarding environmentally friendly practices. "At the FedEx Packaging Lab, our engineers use the latest materials and tools to solve shipping challenges, including environmental ones. FedEx engineer Yongquan Zhou recently helped a customer shipping heavy exercise equipment from China find a more protective and environmentally friendly alternative for a commonly used cushioning material known as expanded polystyrene foam (EPS). His result: a honeycomb-style packaging with corrugated pads and banding, a packaging solution that not only reduces damage at a comparable cost, but is also better for the environment." I assume Mr Zhou didn't wake up one morning out of the blue and thought to himself over the morning cornfakes: "Hmm, I need to find environmentally friendly packaging solutions today". I bet he didn't say to himself " Wow. Honeycomb-style packaging, gotta do something with that". I bet he didn't think, as he helped himself to a third bowl of cornflakes, "I can contribute to saving the planet today by developing environmentally-friendly solutions for Fedex clients". Maybe he did, but the chances are that if he did, it was because of a culture that had been developed at Fedex to ensure employees are aware of their possibilities to contribute to environmental efforts, and provide them with the opportunity to do so. You can't embed CSR if you don't inform, inspire and involve. But seriously folks, stakeholder engagement has its own standard. For the folks who take it seriously. This standard has been revised recently. It's the AccountAbility AA1000 Stakeholder Engagement standard, which is currently the subject of a series of stakeholder consultations around the world, and is available as a wiki for input by cyberspace dwellers. The Standard "provides a defined process of engagement and participation that that will enable comprehensive and balanced involvement that will result in strategies, plans, actions and outcomes that address and respond to issues and impacts in an accountable way." (yes, those long AccountAbility sentences again) It covers the principle of inclusivity, the way to analyse stakeholder groups, and the way to plan, prepare and manage stakeholder engagement processes. As part of our bit to make the world a better place, my Company BeyondBusiness, in partnership with another local consulting firm GoodVision, conducted a stakeholder consultation on the AA1000SE in Tel Aviv earlier this week. Around 20 representatives of the business and non-profit sectors attended, including CSR Managers of our client companies such as Bank Leumi, Teva Pharmaceuticals, Motorola Israel , Maccabi Healthcare Services and others. The Meeting was generously hosted by the National Lottery organization. In general, there was much interest in the concept of stakeholder engagement, which hasn't developed in a structured way in Israel. There was general appreciation for the adoption of a stucutured approach to stakeholder engagement, and a recognition that it takes two to tango - ie even if a business wants to engage external stakeholders, there must be a reciprocal interest in responding and a willingness to engage in open and constructive dialogue. It is not always easy to bring all parties to the table. We all agreed, however, that you get stakeholder engagement, sooner or later, whether you want it or not. In today's era of cyber-information, no corporation operates without someone noticing. Sooner or later, if you dont engage your stakeholders, they will engage you. It's advisable to apply a structured management process to ensure this is a positive interaction. The AA1000SE standard provides the basis. Can Finance Managers count CSR ? Embeding CSR in .... wait for it ... the FINANCE function. Oops! Did i hear that right ? Do CFO's have a CSR mindset ? Isn't CSR just a cost center and not a revenue generator? Isn't that how most CFO's think? So what's the deal with embedding CSR in the financial division of the corporation? 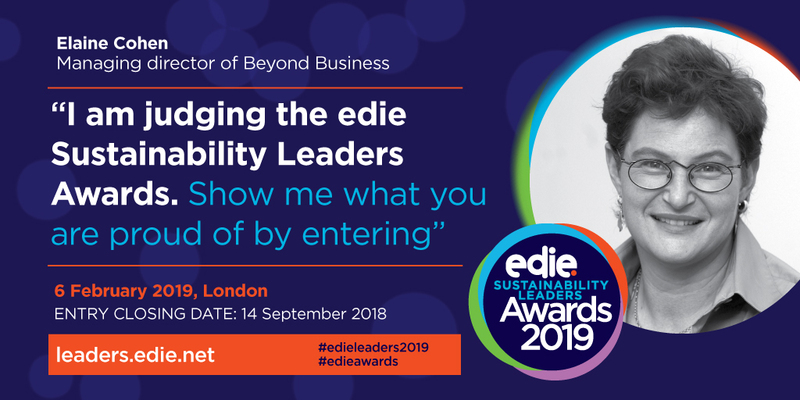 This is another post in my series relating to embedding CSR in the business, prompted by Ethical Corporation's latest research publication on How to embed Corporate Responsibility across different parts of your Company. , a 100 page report published at end September 2009. It provides an analysis and case studies covering 5 organizational functions: Human Resources, Finance and Accounting, Communications, Procurement and Logistics and Operations. I have already blogged about embedding CSR in the Procurement function and in the Human Resources function. Here comes Mr Money's turn. I will pause to tell you a story. I was once attending an Executive Leadership Meeting of a Company, where an unavoidable 60 redundancies were to be made as part of a cost-reduction exercise. The CFO, on hearing this number of people who would be dismissed, shouted out with glee and said " Great!! That will almost solve our cost problem." or words to that effect. The sight of a respected Manager of a large business almost jumping with joy at the fact that 60 people were about to lose their livelihoods still makes me feel rather sick. It's not that I have anything against Finance Managers (apart from the fact that they always seem to control what money is not available, rather than what is), but this "people equal costs" approach is the sad antithesis of corporate social reponsibility. Story over. Finance Managers are also employees and share responsibility to be ambassadors of the corporate CSR approach. They create their share of direct impact through their resources consumption, travel and waste generation , and participate in corporate volunteering activities (unless it's month or year end) . The are the authority on managing the Company's money are the first in line to field investor questions and analyst queries. They are the first to understand the financial implications of most corporate risks. So, it seems there is a basis for the financial function to be a contributor to, and not just a calculator of, a Company's CSR programme. The Ethical Corporation research report refers to CIMA (Chartered Institute of Management Accountants) and IBE (Institute of Business Ethics) who issued a report in 2008 that emphasised the role that ethics will increasingly play in Finance Managers' jobs, based on a survey they conducted. The report covers issues such as advice for finance professionals on ethics, how accounting and finance functions can improve a Company's CSR strategy, the opportunities of carbon trading, ethical checks and balances, and the expectations of ethical investors. Richard Ellis of Boots is quoted in the report as saying "Financial departments need to have an interest in measuring non-financial information" and i agree with him (I am sure he will be pleased about THAT), though we all know that accounting for long term indirect impacts are a little more complicated than the standard accounting exams most CFOs have passed with flying colours. The research report touches on integrated reporting which only a handful of CSR reporting Companies have adopted. Integrated reporting (see also my post on this a while back) is an indication of total systems thinking by an organization and serves to elevate the CSR content to the same level of transparency and rigour as the financial content. And as the owners of the Financial Report, the CFO's cannot ignore this new style content invading their traditional territory. I thought about the CSR reports i read and review, and recall little about the way the Finance Function is involved in CSR. The Australian Real Estate Mirvac Group reported in its 2008 Sustainability Report that it had "established the Climate Change Response Group. This group, which is chaired by Mirvac’s CFO,and includes representatives from corporate risk, sustainability, and all business unit areas is developing Mirvac’s business wide climate change response." I also recall that CSR at the Spanish group Telefonica is managed by the CFO, though i cannot find this mentioned in their CSR Report for 2008. Like it or not, Finance Managers need to embrace CSR as a reality of the business. Like it or not, we will probably find that when they do, we will suddenly have a lot more numbers in our CSR reports. Like it or not, i am now gonna devour my daily tub of Chunky Monkey before its cost feasibility outweighs its contribution to making the world a better place. I am still really looking forward to the upcoming Global Virtual Summit (November 5th and 9th , 2009) entitled New Models of Social Responsibility, presented by Communitelligence and Cisco. The summit boasts a truly impressive line-up of speakers. As my Company, BeyondBusiness , is one of the Media Sponsors for the summit, I was privileged to have the opportunity to interview some of the speakers. You can read my interview with Cecily Joseph, CR Director of Symantec here. This post is all about another impressive woman on the sustainabilty scene - Kathy Mulvany, Director of Marketing and Sustainable Business Practices for Corporate Affairs at Cisco. Kathy will be making opening remarks on Day One of the Summit. Kathy has been with Cisco for 13 years, and has led Sustainable Business Practices for the past 15 months. She wears two connected hats. "Marketing and Sustainable Business Practices are two separate groups that I manage within Corporate Affairs though they both involve communications. My marketing role is focused on building awareness of and engagement in the work we do in Corporate Affairs, specifically our social investments. My sustainable business practice role is focused on overall CSR reporting for Cisco (environment, society, employees and governance), stakeholder engagement and analysis so that we can better inform the business of emerging CSR issues, helping to prioritize CSR issues for which the business functions then set goals, implement programs and measure performance. " As always, this kind of role has personal relevance and Kathy says "I get great satisfaction from helping Cisco have a positive and lasting impact on the world through our corporate social responsibility (CSR) initiatives. I also have the opportunity to work with a great team of people who are passionate and committed to the CSR work they do. And I enjoy finding new, creative ways to tell our human impact story." Cisco is now a seasoned CSR reporter after having produced 4 CSR reports. It is always interesting to me to see how Companies evolve their CSR reporting as each reporting cycle brings tremendous learning opportunities. Kathy explains how it happened so far at Cisco: "Our report has evolved considerably over the last 5 years in terms of breadth, depth, level of transparency and delivery methods. As with many early reporters, our first CSR report in 2005 was an inventory of responses to the Global Reporting Initiative (GRI) framework. This first report set the outlined our overall approach to CSR, our programs and strategies. As our reporting matured we began to focus our reporting on issues that are most material to our sustainability as a business and have continued to deepen the level of disclosure, diligence and measurement in each successive annual CSR report. In the past few years we’ve put particular emphasis on enhancing the readability and user experience of the dense CSR content. In examining stakeholder needs for CSR data, we’ve found new and innovative ways of reporting our progress. We’ve introduced an interactive overview of our global CSR activities to provide a regional context for our CSR performance. We’ve incorporated videos that provide 1st person perspectives. We are also exploring ways in which social media (Web 2.0) might help us improve the dialogue between our stakeholders and business owners" . One of the commendable things about Cisco's reporting is the focus on internal CSR processes and engagement of employees - 31 pages in the 2008 report. Kathy says about internal employee communication and engagement processes "We use a number of internal channels to drive awareness and engagement amongst our employees including newsletters, articles on our company intranet, executive briefs on our CSR engagements, employee meetings at the company and departmental level, CSR showcases during our virtual strategic leadership summit and global sales meeting, informational fairs, etc. In addition, we use a number of Web 2.0 technologies to bring our CSR story to life including videos, blogs, RSS feeds as well as WebEx and TelePresence sessions." My regular readers will know that i am a fan of localization in reporting - i.e. the practice of reporting a local level by global companies, in addition to global reports which have less relevance for local stakeholders. Cisco have an interesting approach with regional and country updates on in an interactive presentation on the Cisco CSR report website. Kathy says: "Cisco's CSR report is intended for external and internal parties who want current and historical information about Cisco’s performance on CSR issues. Our audience includes financial and industry analysts, investors, customers, NGOs, employees, academia, government, and the media. A topic of very active discussion is how to balance the detail needed by analysts and the readability desired by those wanting a general overview. Because we respond to hundreds of stakeholder CSR inquiries and surveys throughout the year, it is advantageous to publish a complete reference to support such interest and inquiries. Conversely, we also receive feedback to make the reporting shorter and more accessible. As such we introduced the regional interactive overview for those who wanted a high level snapshot of our CSR work around the globe. We continue to research web-based tools that satisfy both audiences in a scalable and cost effective manner." Whither Cisco CSR in the coming years? "We continue to develop best practices for our CSR programs through benchmarking, IT sector engagement and dialogue with multiple stakeholder groups. For the longer term, however, we are focusing on enhancements to our governance structure and driving CSR innovation across multiple organizations. We have started this process by engaging in Cisco’s new Collaborative Management Model and reporting into Cisco’s Connected Business Operations Council. We feel this is the most efficient approach for reporting up into cross functional senior leadership. We also actively engage with our boards and councils as needed. More information on this will be included in our FY09 CSR Report." If you want to know more about network enabled sustainability and Cisco's leadership in this field, take a look at their report and website. If you want to hear more from Kathy Mulvany and other Cisco colleagues, come to the Global Virtual Summit on New Models of Social Responsibility . I am sure that we will hear more from Cisco that will insprie us. Thanks to Kathy Mulvany for generously sharing insights, thanks to John Gerstner, visionary founder and president of Communitelligence. Back to embedding... this time i will take a look at the procurement section of the Ethical Corporation's latest research publication on How to embed Corporate Responsibility across different parts of your Company. This is a 100 page report published at end September 2009. It provides an analysis and case studies covering 5 organizational functions: Human Resources, Finance and Accounting, Communications, Procurement and Logistics and Operations. Last time i blogged about embedding in the Human Resources function. This time, being an ex Supply Chain executive (8 years in Supply Chain function with P&Gin Europe, including several years of Purchasing), I will cover csr in the buying office. The Ethical Corporation guide highlights examples of how companies address CR challenges in supply chain activities and procurement operations, and how sustainability and ethics are embedded in the supply chain, with reference to codes of conduct and even data sharing and collaboration with competitors (anti-trust regulators permitting!). The section is full of fascinating case studues from HP (target setting in the supply chain), Green and Black's (engaging NGO's to develop supply chains), Innocent drinks (contract terms) ,Sedex (supply chain goals) and Pepsico (cooperating with competitors). The report lists some conclusions - guidelines which all buyers should heed - i cannot list them all (you know why!) , but the first one is be transparent about your suppliers. That's an interesting point, not something the average buyer thinks about, i suspect. Certainly one which i never considered when i was buying tens of millions of $ of raw materials for P&G products many moons ago. Think about it. You are the buyer for your Company. Everyone knows who your suppliers are. How risky is transparency ? It's less risky if you manage it. What if your suppliers are exploiting children in their supply chain? What if they are abusing human rights? What if they are releasing tons of contaminants into a local river ? What if they are involved in bribery and corrupt business dealings ? What if they have been involved in discriminatory behaviour? What if they are using illegal raw materials, or operating with unsafe practices in their plant? I could list hundreds of cases in which corporations have been penalised or incurred cost penalties because of the actions of their suppliers - Mattel and Hasbro due to illegal practices by Chines toy manufacturers, Nestle's issues in sourcing milk from Grace Mugabe at the expense of local farmers, issues for Primark on child labour in the supply chain and many more. What is the risk that these issues come back to haunt you, because this is part of your responsibility for your supply chain. How do you safeguard against this risk? It's one thing to have such issues in your supply chain, it's another if you never even talked to you suppliers, made your expectations of ethical business clear, or inspected them in some way. As the buyer for your Company, what questions do you ask of your suppliers ? How do you manage the issues that your suppliers can potentially create for your business? This is part of buying CSR due diligence. Transparency is decidedly less risky if you have a policy and practice designed to identify and reduce risk. This question is not new for the apparel industry, and Levi Strauss was the first apparel brand to establish a supply chain sourcing code and publicly disclose all its suppliers. Since then, many other apparel brands have followed, but other industries such as toys, electronics, computer hardware etc are slow to follow. CSR in the supply chain is a frequent section in CSR reports. Gone are the days when corporations can plead ignorance of what is happening in their supply chains, and gone are the days when stakeholders accept "We didn't know" as a viable response. So if you are a Purchasing Manager, and you aren't aware of the risks in your supply chain, my advice is do something about them before they do something about you! Dying to work at France Telecom ? Every so often things make you quite angry. During the past 20 months, 25 France Telecom employees have committed suicide, and several others attempted to do so. What is it about the culture in this Company that puts people under so much pressure that they take their own lives? What is the repsonsibility of a Company to ensure that the working environment and culture can not allow such an epidemic of suicides to take place ? One suicide is an exception. 25 suicides is a corporate crime.
" Aware of the increasing seriousness of work-related stress, since 2000, the Group has taken steps to prevent this type of risk. A commission dedicated to preventing stress was formed with staff representatives. Its work has made it possible to offer concrete solutions, and improve the work environment in collaboration with the business units. In 2007, these activities were bolstered by the implementation of “Espaces d‟écoute et d‟accompagnement” (Listening and Support Spaces), which are teams that try to provide solutions, in consultation, either individually or collectively. In 2008, we implemented stress management training sessions - one “Stress management” module for employees confronted with difficult situations with customers, and one “Management practices and stress situations: guide for action” module designed for managers." and whilst the graph of occupational accidents frequency rate shows a nice downward trend between 2004 and 2008, there is no mention of fatailities or suicides. I was also surpised to note that " France Telecom assisted in developing a guide to good practices for workplace wellbeing, published by CSR Europe.". Oops. This is the problem we all have with CSR reports. Plenty of good news and convenient glossing over the bad news. The assurance process should pick this up, but clearly even paid independent-dependent assurers have their limitations. It is clear why Companies are selective about their transparency. However, what France Telecom doesn't realise is that the issues they have are transparent whether they report them or not, and that they urgently need to be addressed on a scale which is more significant than stress management workshops. Perhaps France Telecom will bite the bullet in their next report and cover this issue more fully. In the meantime, the fact that this siutation appears to be ongoing and increasing in intensity, makes me angry. Losing your life whilst doing your job should not be an option.